Pilot Don Cheney (bottom row, centre) with the crew of his Lancaster before their ill-fated 1944 mission to bomb Nazi submarine pens on the coast of occupied France. 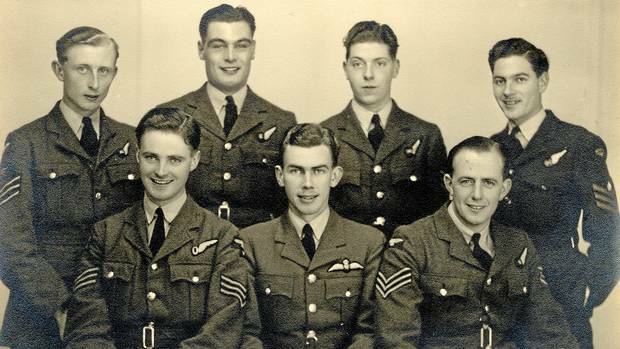 Top row, left to right: Wireless Operator Reg Pool, Flight Engineer Jim Rosher, Rear Gunner Noel Wait, Mid Upper Gunner Mac McRostie. Bottom row: Navigator Roy Welch, Pilot Don Cheney, Bomb Aimer Len Curtis. Only four members of the Lancaster’s crew survived after the plane was downed by German anti-aircraft fire: Pool, Wait and Welch parachuted from the Lancaster, but died of their injuries. All three were buried in France. Don Cheney DFC, one of the best known 617 Squadron pilots from the 1944 period, has died at his home in Ottawa, Canada. He was posted to the squadron in February 1944 having completed 22 operations in 106 and 630 Squadrons. He flew on another 15 in the next few months, and became accomplished in the dropping of the 12,000lb Tallboys which had recently become available. Don took off on his 40th mission. Against all odds, he had suffered only a single injury so far, when a tiny, red-hot fragment of German shrapnel ripped through the Lancaster’s aluminum skin and hit him in the ankle, knocking his foot off the rudder pedal as he flew. Don said it felt like a bad bee sting. Don always made it back. Now his luck was about to change. The mission that day was to drop a Tallboy on the Nazi U-boat pens at Brest, on the coast of occupied France. As they made their final approach to the target, the air was filled with flak shells that exploded around them like giant black cauliflowers with flaming centres. Don gritted his teeth and followed the bombardier’s instructions – to hit the submarine pens, they had to go straight through the worst of it. Their bomb hit the target, but Don’s Lancaster took at least half a dozen direct hits. One of the engines blew up. The wings were filled with holes, and the fuel tanks were on fire. The airplane nosed over into a dive. Don knew that the wings would probably rip off soon, their structure eaten by fire. Or the entire plane might go up in a final ball of fire. He ordered the crew to bail out. The tail gunner called over the intercom, “Wait for me!” He needed time to escape. Don fought with the controls, and kept the Lancaster flying at it fell apart. One of the hatches jammed, but five of the crew got out. But radio operator Reg Pool was stuck in his compartment, critically injured by flak. Don left the cockpit to help Reg. But as he pushed Reg toward the door, the bomber started plunging into a steep dive. Don climbed back into the cockpit and pulled the plane’s nose back up. Then he returned to Reg, put Reg’s hand on the ripcord, and pushed him out the door. The Lancaster was dropping into another dive. Don climbed back to the cockpit yet again. Now he was alone. The instrument panel was starting to melt, and a tornado of wind ripped through the disintegrating plane. Don squeezed through a tiny hatch in the top of the cockpit and flashed by the Lancaster’s tail into open air. He deployed his parachute and landed in the ocean, where he had to dodge Nazi machine gun fire. The French Resistance pulled him out of the water. For the next three months, he was hidden in the home of Resistance leader Aristide Quebriac. Don showed me photos of Quebriac, who later was given the Croix de Guerre by Charles DeGaulle. Don and Quebriac stayed in touch for the next 55 years, until Quebriac’s death 10 years ago. Death announcement in Toronto Globe and Mail. Article in Ottawa Citizen about the wartime portrait of Cheney taken by the famous photographer Karsh. Transcript of interview with Don Cheney, Canadian War Museum Memory Project.